It is fair to assume that no art historian wants to be superficial in his or her approach to visual analysis and that we encourage our students to look closely and carefully, too. We take our time in contemplating a painting and inspect it in detail, and model this in our classes. Nevertheless, our eyes cannot penetrate the topmost paint layers and our glance cannot but skim the surface. So, in the final reckoning, our approach remains—in a certain respect—’superficial’. Contemporary scientific methods allow us to peek beneath the surface of the painting. (Describing the science in detail would go beyond the scope of this post but information on these methods can be found elsewhere for those interested). I would like to argue that a look beneath the surface of a painting offers a deeper insight into its materiality, and the specific technical and cultural context of its maker(s). This, in turn, lets us as historians, and our students as budding historians, experience art in a new and more profound and enjoyable ways. In this short post, I investigate the painted materiality of several works, focusing on the example of depiction of textile materials in some well-known renaissance and baroque paintings. Doing so allows our students to understand ideas like craft, skill, technology, and the process of in-depth visual analysis. Showing our students how Science and Art overlap and benefit from each other is an additional advantage of this approach. 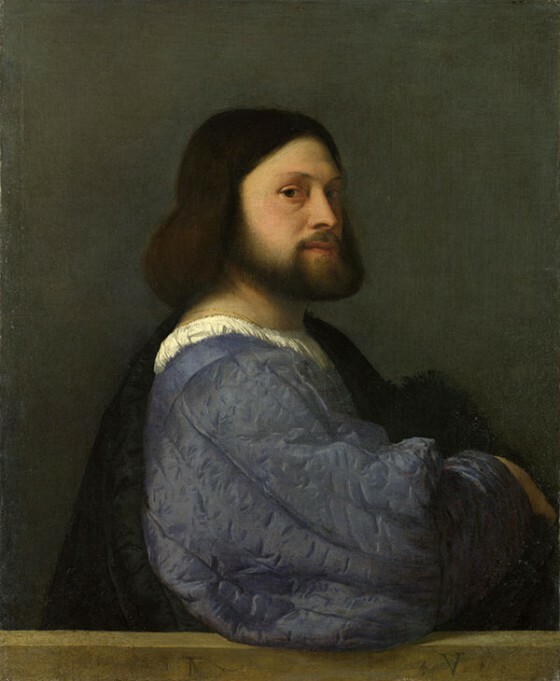 The portrait of a member of the Venetian Barbarigo family is one of Titian’s early works. The dynamic stance of the sitter, his “over the shoulder” pose and his physical presence were to serve as a model for portraits for the centuries to come. Our attention is immediately drawn to the dominant quilted and padded sleeve. The obvious question is: how did Titian achieve this tangible feeling and the shimmering appearance of the fabric? No amount of visual scrutiny can lead us to the solution of this mystery. Conservators at the National Gallery London describe the painting technique as follows. They inspected the paint samples from the sleeve as well and found out that Titian painted the sleeve in several layers to achieve the desired effect. The first paint layer consists of two red pigments mixed with lead white. The source of the first red pigment called carmine are insects living on cacti. The second red pigment, madder lake, is prepared from the roots of the madder plant. Next are alternating blue and purple layers consisting of varying amounts of natural ultramarine, red lake, and lead white. The result is an almost palpable depiction of quilted and padded satin fabric. Ask your students what they notice about this work and the red robe is often an early response. It is obvious that Magdalen’s red robe executed in several layers of carmine and madder lakes is the dominant element of the painting. However, ask them to look again—hopefully very close to a good, hi-res image of the work on a large screen. 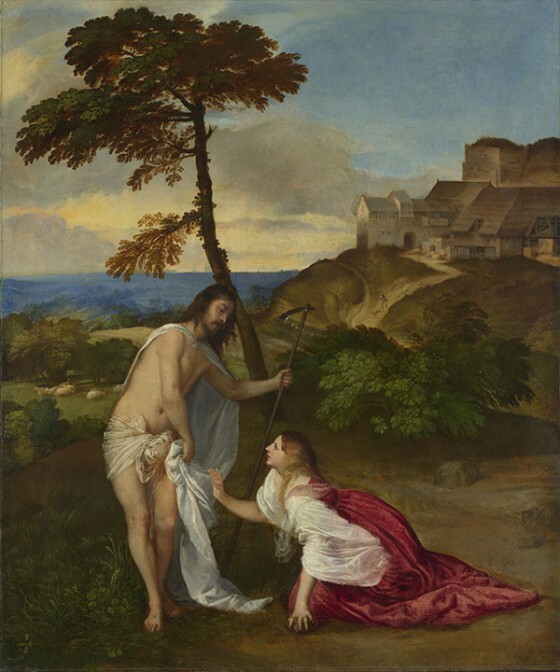 The depiction of the four white fabrics is the true sign of Titian’s mastery in handling color. Christ’s loincloth, his white cloak, Magdalen’s white sleeve, and her veil, are all painted in pure lead white. But every one of these textiles shows a distinctly different appearance. We can again try to analyze Titian’s technique to gain a deeper understanding of this painting. Christ’s loincloth is painted with a more fluid paint (thinned out by the addition of more oil) to achieve the semi-transparent appearance of the fabric. His white and opaque cloak is painted with thicker paint. Magdalen’s translucent sleeve is painted with fluid paint but shows also thicker paint layers (impasto) in the denser areas. Her almost fully transparent veil is painted very thinly with an almost dry brush. The painting shows the decisive moment of a story from the Old Testament of Delilah’s deception (Judges 16). Samson possessed immense strength and was invincible. But Delilah lulled him into telling her the secret of his strength, which was his uncut hair. A man in the painting is just about to cut Samson’s hair and his enemies – the Philistines – are already waiting at the door to seize him. The depiction of draperies in this baroque painting is interesting on several counts. First of all, let us look at Delilah’s dominant red drapery with its rich folds and alternating highlights and shadows. The richness and depth of color are indeed admirable. We might stand in awe in front of the painting in the National Gallery in London. But we also might wonder how Rubens achieved these splendid colors. He employed a mixture of vermilion and carmine lake tinted with a little lead white and black for the middle tones. The shadows contain pure carmine lake, the highlights are painted in lead white glazed with a carmine lake. And the reflection of the candlelight on the red satin in Delilah’s lap? Here, Rubens mixed an orange-yellow pigment into the lower layer and also into the glaze on the surface. 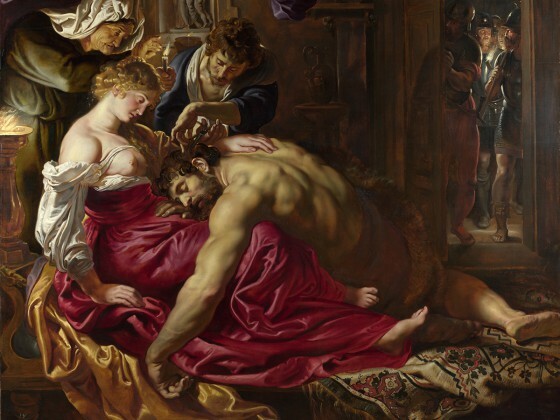 The gray-blue coat of the man cutting Samson’s hair is another striking feature of this painting. The entire painting does not contain a single blue pigment. Instead, Rubens choose a different and novel way to achieve this particular color using lead white and charcoal black. The bluish color of this pigment mixture is due to the stronger absorption of the red part of visible light by charcoal black. It is also noteworthy that no pure and permanent violet pigment was available to painters until the nineteenth century. Usually, painters seeking this color impression would either mix blue and red pigments or paint a red layer over a blue one or vice versa. But Rubens again did not travel the conventional path and instead employed charcoal black and lead white mixed with red lake for the purple drapery hanging from the ceiling. This method of achieving purple color is exceedingly rare in European oil painting. The subject of Art belongs to the Humanities but a work of art is a material object and as such is accessible to Science and its methods. The examples shown above are meant as an inspiration and encouragement to include the results of scientific investigation of paintings in teaching of Art. It is sufficient to concentrate on a few wisely chosen cases exemplifying different aspects of Art and Science and different scientific methods to broaden the horizon of the students. Jill Dunkerton and Marika Spring, with contributions from Rachel Billinge, Kamilla Kalinina, Rachel Morrison, Gabriella Macaro, David Peggie and Ashok Roy, Titian’s Painting Technique to c.1540, National Gallery Technical Bulletin, volume 34, 2013, pp. 4-31. Jill Dunkerton and Marika Spring, with contributions from Rachel Billinge, Kamilla Kalinina, Rachel Morrison, Gabriella Macaro, David Peggie and Ashok Roy, Titian’s Painting Technique to c.1540, National Gallery Technical Bulletin, volume 34, 2013, pp. 4-31. Catalog part I pp. 62-67. Plesters, J. 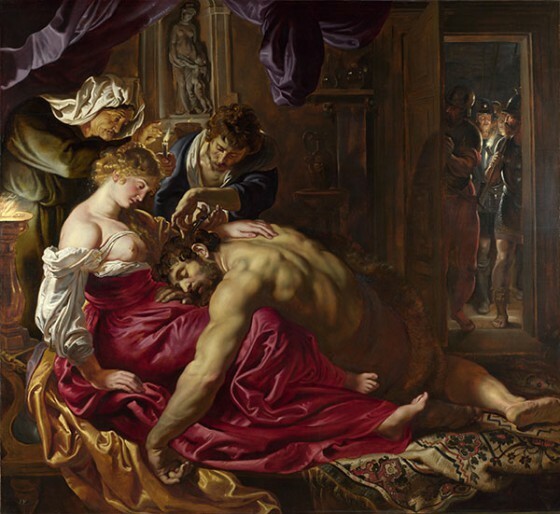 ‘”Samson and Delilah”: Rubens and the Art and Craft of Painting on Panel’. National Gallery Technical Bulletin Vol 7, pp 30–49. National Gallery London, “Making Purple: The Science of Art”, Video accompanying the National Gallery exhibition ‘Making Colour’ (18 June – 7 September 2014).